Scott Brash will finish 2015 as the world's top-ranked show-jumper. It is the third year in a row that the 30-year-old Scot, now based in West Sussex, has held the top spot. Brash has been competing at Olympia in London, finishing fourth in the Longines FEI World Cup on Hello M'lady on Sunday. "I was delighted with Hello M'Lady," said Brash. "She's only nine-years-old and she's getting some really good results at five star level." With some of the biggest names in show-jumping at Olympia, the rider from Peebles admitted it was very competitive climax to a memorable season. "All the riders chase the World Cup at this time of year, so you always have the best riders here," he said. 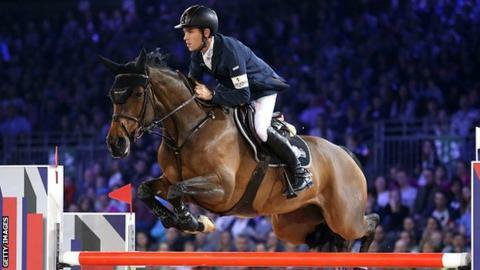 In September, Brash made show-jumping history, winning the Calgary Grand Prix, adding to triumphs in Geneva and Aachen, to complete an unprecedented Grand Slam on Hello Sanctos. He is now looking forward to some down time. "We have few weeks off now to celebrate Christmas before we get going again," he added. Brash will soon begin preparing for the Olympic Games in Rio, having won team gold at the 2012 Games in London, where he narrowly missed out on an individual medal.